This is the message I preached on Pentecost Sunday, 5/20 at St. Timothy Lutheran Church. The text was Romans 8:22-27. Today is Pentecost, the day we celebrate the beginning of Christ’s church. 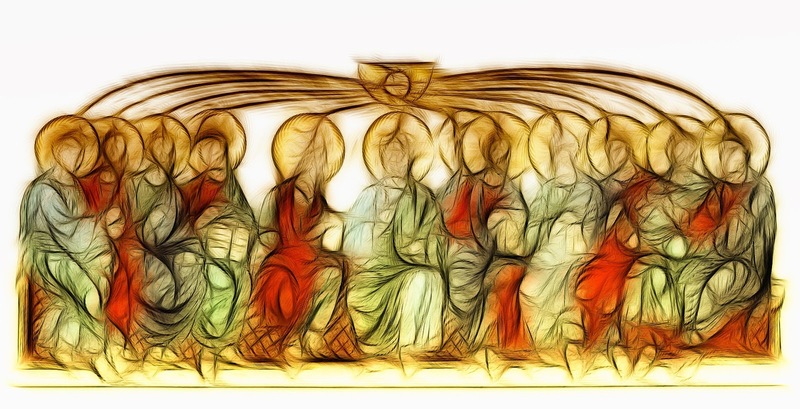 However, Pentecost is far more than simply the birthday of the church, though it is that too. It was but the beginning of God’s work after Jesus had ascended to his Father in heaven. Especially in the Book of Acts we read of many miracles being done through the apostles as the Holy Spirit worked through them. Miracles also continue today as God the Holy Spirit works through God’s people. Bishop John Macholz has designated today as Companion Synod Sunday. The Upstate NY Synod is in a companion relationship with the Evangelical Lutheran Churches in Zimbabwe and Zambia. In our affiliation, we follow a model of accompaniment. We walk with our brothers and sisters. Our relationship with them is not a monetary one. It is designated and supported by the ELCA Global Mission Office. On the screen are pictures of some of our Lutheran brothers and sisters of Zimbabwe and Zambia. During fellowship, stop by to watch the PowerPoint about God’s work in those places. I don’t know if you’re aware of this or not, but the fastest growing churches are not those in the United States, despite the number of megachurches there are, but they are in what is referred to as the global south—countries south of the equator, such as Zimbabwe and Zambia. In places such as these, people are willing to walk hours to get to church. Their commitment puts many of us to shame. Perhaps this is why these churches are growing exponentially. All of this is the work of the Holy Spirit in and through God’s people. But where does that leave us? Why don’t we see miracles? Why are so many people unwilling to sacrifice in the same way as those south of the equator? I certainly don’t have all the answers—none of us do. However, I think some of it has to do with those things that are most important in our lives—our spouses, children, parents, recreation—all of which are good and right things, but is there room for God in all the busyness of our lives? That brings us to the second reading from Romans chapter 8. Have you ever experienced the painful groaning that Paul describes here? A number of people in our congregation have experienced a great deal of loss over the years—loss of spouses, children, grandchildren and other people and things they held dear. Notice that in these verses, we are not the only ones groaning. A holistic vision of the world is presented by Paul as he writes, “Creation has been groaning in labor pains until now; and not only the creation, be we ourselves…groan inwardly while we wait for adoption” (vv. 22-23). The church in Rome experienced real pain and agony and Paul wrote to them of the wail of souls longing for the fruition of the redemption they knew so well, the restoration of all things, including creation, promised in Christ Jesus. We Lutherans refer to this as the “now, but not yet” proposition of our faith. Our salvation is now, but we do not yet experience it fully. We know of the return of Jesus. We prepare for his coming and see the whole creation groan for restoration. As Paul wrote, “…we ourselves groan inwardly while we wait…” (v. 23). These words regarding creation’s pain bring the focus out of our own personal lament to see the great need of the world. When we experience pain, it can draw us inward, sapping us of all energy. Paul is calling the Roman church and us to an outward interconnectedness that doesn’t deny our pain, but allows us to see and serve the world through it. It is a very humbling experience to be aided by someone with many struggles of their own. Hope is born out of the disconnect between what is — the now—and what should be—the not yet. The pain of current suffering is expressed in groaning. Pain is acknowledged, experienced, lived through and not denied. The glorious resurrection of Jesus does not erase the agony of the crucifixion, nor does it justify it. Resurrection life and light is coming. We do not escape suffering through faith as a form of escapism, rather hope gives us the strength and courage to endure and work for a better future. Hope keeps us from falling into despair or apathetic acceptance. Waiting patiently does not mean we acquiesce to the current state of affairs. Hope requires a willingness to risk trusting in what is not empirically verifiable (God’s promise), even when physical evidence suggests that doing so is foolish (Rindge). Hope is born out of life in the Spirit. We are inspired to make a difference in our world of crime, addiction, homelessness, hunger and loneliness. The word “inspired,” literally means “in-Spirit.” In the past, it meant “to infuse (breath, life, etc.) by breathing...to breathe into or upon” (dictionary.com). In both Hebrew and Greek, Spirit and breath are synonymous. We have seen the first fruits of the Spirit in Jesus Christ-love, forgiveness, welcome and grace; all of which are but a glimpse of the coming kingdom, for which we wait in hope. We have a foot in each world. The first fruits are the now, while we experience the groaning and suffering and hoping of the not yet. We enter into a holy groaning or lament with the groaning Spirit of God. Pentecost is all about the Holy Spirit and the groaning, lamenting side is one we rarely explore. Think about it: creation groans in the throngs of ecological crisis. Our nation groans in racial and socio-economic injustice, friends and family members of those killed and injured in schools, like that of Santa Fe, TX, groan in loss. Our world groans under extremism and growing inequity between haves and have-nots and we ourselves groan inwardly because we are inextricably connected to the world. Groaning leads us to hope…our tears create the pillow for the Gospel of Hope…hope is tear stained” (Luke Powery). Think about your own grief and pain, which the flames of Pentecost can sometimes burn. We are weak. We do not know how or what to pray. There are good reasons for that. For one, we cannot see the future. Also, in any given situation, we do not know what is best for us. And then there are those times we don’t even care about our inability and need. We are just plain tired and feel squeezed right in the middle of our circumstances. We may be part of the “sandwich generation,” which deals with children still at home with needs and parents that increasingly need our help. What are we to do?? I have good news for you. God does for us what we cannot do for ourselves. In the mess of our world and lives, the Holy Spirit prays and acts for us in ways we cannot do ourselves. Sometimes don’t we think that to pray according to God’s will, we’ll be ok as long as we tack on the words, “in Jesus’ name. Amen?” Let’s be honest. Here in our inability “God, who searches the heart, knows what is the mind of the Spirit, because the Spirit intercedes for the saints [that’s us, not just someone who died] according to the will of God” (v. 27). Are any of you science-fiction fans or is it just Ray and me? On one of the shows we’ve started watching, there is a character whose head has many faces with eyes that go all around his head. I think of God the Spirit in that way. The Spirit looks into and totally understands our hearts, exactly where we’re at and simultaneously knows what God’s will is, looking into God’s mind. This is how the Holy Spirit prays for, in and through us. With all the imagery of labor pains, we may think of the Holy Spirit as the midwife who brings to birth the living will and power of God in us and our world. That which God brings to birth can totally upset our apple carts, much as a new baby can disrupt a household. The strong wind of the Holy Spirit can blow hard at times. Some things get moved around while others are destroyed. Do we wish our church was growing in the way those of Zimbabwe and Zambia and other global south churches are? Witnesses in Africa, Asia, Central and South America report miracles, exorcisms and strange abilities of missionaries to communicate in native languages without translators or study of local languages. It might be uncomfortable for us to experience God’s work in a powerful way. Are we ready and willing to open ourselves to a new Pentecost, a new outpouring of God’s Spirit here in our church and in our lives? I’d like to close with the words of a chorus we used to sing in Jerusalem. I pray this becomes the cry of our hearts. Holy Spirit, you are welcome in this place. You are welcome in this place.